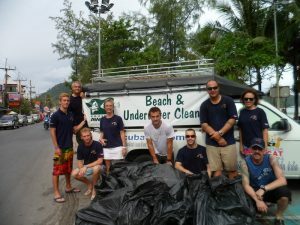 Thanks you to Scuba Cat’s two new Divemaster’s Sarah and Cal who organised this mornings clean up on Patong Beach. 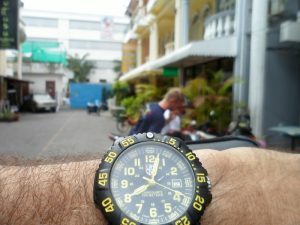 At 7.30 am this morning we met at Scuba Cat Diving in Soi Wattana, Patong. Just after 8.00am, after two cups of coffee we were ready to get to work! We arrived at Patong Beach and were each presented with a pair of “Orange” Rubber gloves and a black bin bag. Cal and Sarah arranged us into two teams, starting in the middle of the Beach and working away from the other team. We had 1 hour! Lek, one of Scuba Cats Drivers, was with us all to act as the collection point for the morning. Bottles, cigarette ends, used condoms!, to name a few things we found…… oh how we wish there were ashtrays and trash bins on the beach, what a difference that would make!!!! Thanks to Sarah and Cal, Divemaster’s for organizing the morning, Bryan and Reidar for helping us during their IDC, Matt DMT and Max, Ben and Thibault for joining us during their University Internship with Scuba Cat. 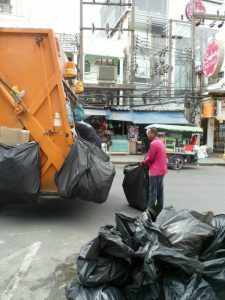 And of course a big thank you to the “Bin Men” from Patong, for helping us dispose of the Rubbish afterwards. 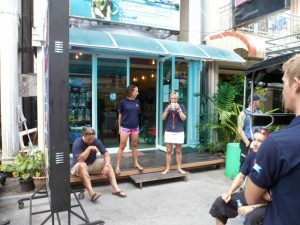 We realized an hour wasn’t long enough to really make a difference so we have decided to carry out a beach cleanup in Patong on a monthly basis as part of our IDC, along with our already scheduled monthly Underwater Cleanup. If any one wishes to join us for either event please contact us for more details. This entry was posted on Monday, July 2nd, 2012 at 3:52 pm	and is filed under Environmental News. You can follow any responses to this entry through the RSS 2.0 feed. Both comments and pings are currently closed.